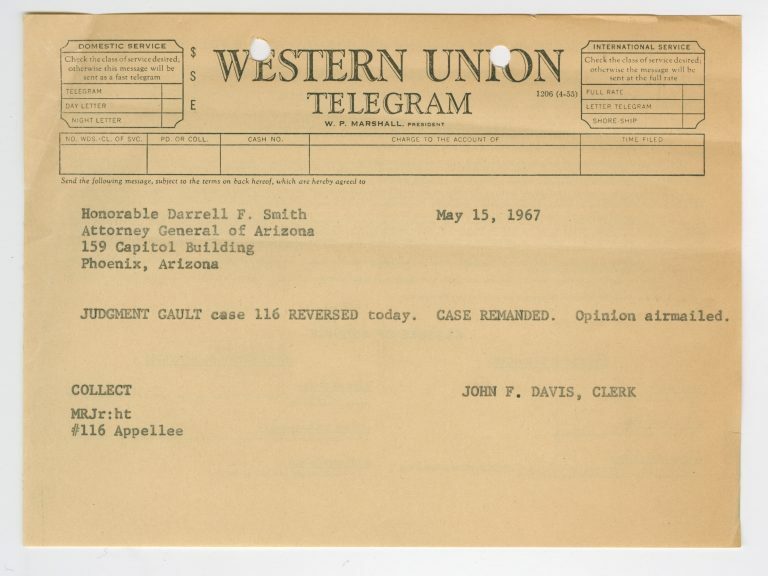 50 years ago today, on May 15, 1967, Supreme Court Associate Justice Abe Fortas delivered the landmark United States Supreme Court opinion in Application of Paul and Marjorie Gault, 387 U.S. 1 (1967), which held that juveniles accused of crimes in a delinquency proceeding must be afforded many of the same due process rights as adults, such as the right to counsel, the right to confront witnesses, the right against forced self-incrimination, and the right to maintain a record of the proceedings. Source: Record Group 267: Records of the Supreme Court of the United States, 1772 – 2007 Series: Appellate Jurisdiction Case Files, 1792 – 2010, File Unit: Case File 116, October Term 1966, In Re Gault. The link to the catalog record for the digitized case file can be found in the “archival materials” section of the research portal. To mark in re Gault @ 50, we have launched a new research portal that offers links to archival materials documenting the case, as well as references to selected scholarship analyzing the history of the case and the state of due process in juvenile court. 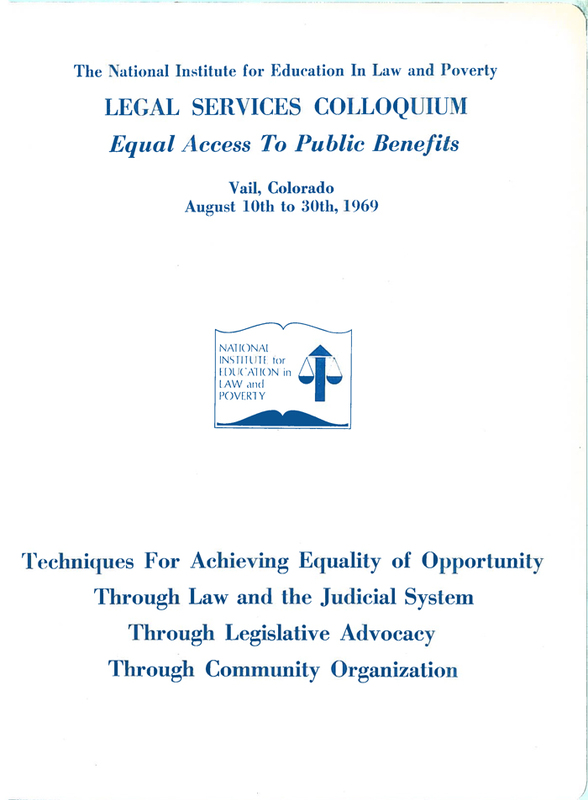 Related NEJL materials: Oral history interview with Marshall Hartman, who co-authored the amicus curiae brief for the National Legal Aid and Defender Association. The other authors of the NLADA brief were L. Michael Getty and James Doherty. The NEJL also holds the James Doherty Papers. This entry was posted in General on May 15, 2017 by Katharina Hering. Marshall Hartman, one of the founders and former president of the CNEJL, has received the Illinois State Bar Association’s Laureate Award. This entry was posted in Defender materials, General, Oral history interviews on May 15, 2017 by Katharina Hering. Thomas Buckley, a retired professor from the Cleveland-Marshall College of Law, donated his collection of materials from the National Institute for Education in Law and Poverty (NIELP) to the NEJL. Thomas Buckley served as the Deputy Director of the NIELP from 1967-1971. The director was Craig W. Christensen. The Institute was established in 1967 at Northwestern University School of Law to develop and implement an educational program for Legal Service attorneys. The goal w as to go beyond serving “individual clients with individual problems,” and train lawyers as advocates to address systemic issues of poverty and “make new law on behalf of the poor,” writes Buckley. Welfare law and consumer law weren’t even taught at law schools at the time, and the training programs document the dynamic development of these areas of law at the time. The collection includes materials from the 1968 Conference on Welfare Law and materials on the Uniform Consumer Credit Code, prepared by the National Consumer Law Center in 1969. Thomas Buckley graduated from Fordham University (1958) and from Yale Law School (1961). Prior to joining NIELP in 1967, he was a Visiting Professor at the School of Law at Boston University Law School (1966-1967) and an Assistant Professor of Law at the University of North Dakota School of Law (1964-1966). From 1961-1964, he was an Associate at Carter, Ledyard & Milburn in NYC. Buckley joined the faculty at Cleveland-Marshall College of Law in 1971. This entry was posted in General, History of Legal Services, Research, War on Poverty anniversary on May 14, 2017 by Katharina Hering. “Georgetown Law Hosts Meeting of Legal Services Corporation Furthering Access to Justice,” May 1, 2017. This entry was posted in General on May 2, 2017 by Katharina Hering.